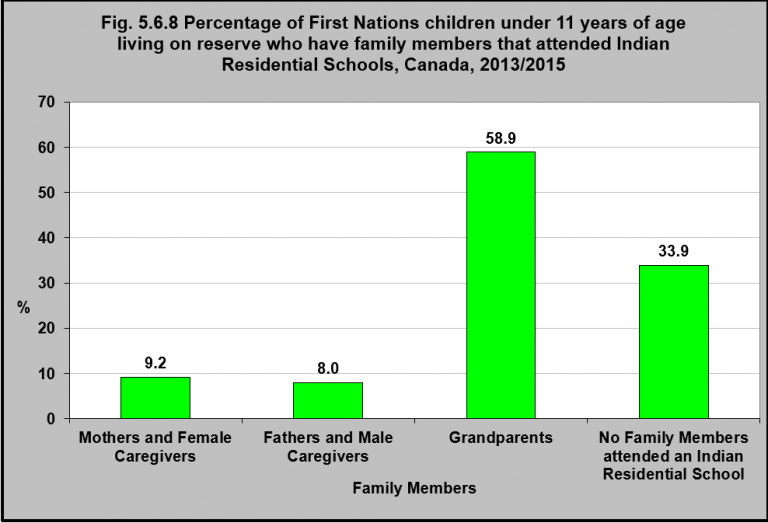 In 2013/2015, 9.2% of First Nations children under 11 years of age living on reserve had a mother or female caregiver that had attended an Indian Residential School. 8% had a father or male caregiver that had attended. Fifty-nine percent of First Nations children under 11 years of age living on reserve had at least one grandparent that had attended an Indian Residential School. Over the years, the number of Indigenous people who have had direct experience with Indian Residential Schools continues to decline. Nevertheless, the physical, emotional, psychological and spiritual harms that Indigenous children experienced in these schools have left traumatic scars, manifested in mental health issues such as depression, post-traumatic stress disorder, and substance abuse, which in turn have had adverse intergenerational consequences.1 This intergenerational trauma is evidenced by the rates of violence within Indigenous families and communities and in the rates of Indigenous children in the child welfare system, and must be considered in the development of programs and services for Indigenous people that focus on individual and collective healing and the rebuilding of relationships. 1Bombay, A., Matheson, K., & Anisman, H. (2009). Intergenerational trauma: Convergence of multiple processes among First Nations people in Canada. Journal of Aboriginal Health, 5(3), 6-47.